VANCOUVER, Oct. 1, 2017 /CNW/ - User-friendly smart contract creation tool Etherparty is excited to announce the opening of the public phase of the FUEL token crowdsale. The launches today, on Sunday, Oct. 1, 2017 at 9 A.M. PDT (12 PM EDT / 5PM BST / 4PM UTC) and runs until Oct. 31 unless all tokens are sold prior. 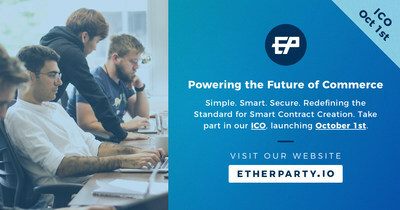 Those interested can go directly to etherparty.io/ico to take part in the crowdsale. 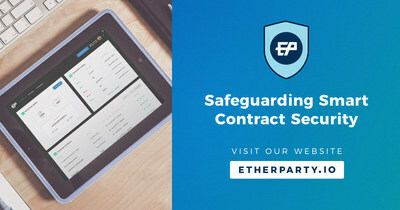 "Etherparty will enable anyone to create, publish, and integrate smart contracts into their business and application," said Etherparty CEO Kevin Hobbs, who added, the platform's clean interface and ease-of-use will make it possible for greater adoption of smart contract technology and the benefits around self-executing digital agreements. "We're really excited to get some users active on the EP platform during our first beta test," said Etherparty Architect Brian Onn. Onn added, "Our team of developers have put in a fantastic effort to reach this point and we're looking forward to receiving user feedback and taking that feedback directly to the platform for our next beta cycle."